even Olympic champions, looked, at times perplexed. Now we’re going to breakdown each of the televised games and see how each team adapted to this rule. Kevin Martin asks for lead Ben Hebert to put his first stone in the top four foot. Rather than place a corner guard, Stoughton lead Steve Gould hits and rolls to the 12 foot. Martin hits and stays. Now Jeff calls for a corner guard, with Martin unable to remove it on his second’s (Marc Kennedy) first rock. Kevin instead calls for top twelve, cutting off the path around the corner. This strategy (cutting off corner guards) was used to perfection by the underdog Mike Riley rink against Werenich/Savage during the 1984 Brier finals and was likely used often during this event. A mistake by Stoughton on a blank attempt and Martin steals one point. In the second end, similar beginnings, Martin goes in the house, Stoughton calls a hit, Martin hits and now the corner guard goes up. This delay in putting up the corner now means when second Marc Kennedy puts up a centre guard, Stoughton can hit it. This scenario for leads rocks in the first two ends shows how, when their opponent plays into the rings, the 5-Rock rule allows the team with hammer to avoid stacking rocks into the middle around a centre guard and instead get a corner guard in play. This situation alone has me favoring the 5-Rock rule over 4-Rock. In the traditional 4-Rock FGZ, the team ahead without hammer can put their first rock in the rings. Their opponent puts up a corner guard and they now can place a guard in front of their rock, and it can’t be hit. The cost for a team to place the corner is significant and the opposition didn’t actually need to make a draw around a guard. In the 5-Rock rule a team without hammer does not gain this advantage. In retrospect I wonder if Kevin would reconsider placing his first rock out front rather than in the rings. Rather than hit, Kevin ponders the freeze to the rock on the tee-line. Watching this, Stoughton’s caught on camera saying to third Jon Mead “yah, go for it”. I was also surprised by Martin’s call. Though it was thin, it appeared Kevin could easily double the two rocks in the four foot and possibly spin in behind the guard. Even if Kevin gives up a deuce he’s only 1 down. By playing the freeze, Kevin increased the chance for Jeff to score three and even gave some possibility of four. Stoughton ends up scoring three when Kevin’s rock doesn’t curl enough. In the third end, Martin (now two down with hammer) throws a corner up after Stoughton puts their first rock top four. Lead Steve Gould then places his next rock 2 inches from the house, guarding shot stone. Martin elects not to throw up the second corner and instead tries a corner freeze around the tight centre guard. Hmmm, didn’t he follow what Jeff did in the first two ends? Despite the crowded beginning, by skips rocks everything has been removed and another blank end. In the fifth end, Stoughton escapes some potential danger by making a run back and Kevin missing his first draw attempt. Martin is forced to one and scores his only point of the game with hammer (recall Jeff handed him a steal in the first). Thought there was suppose to be more offense? In the 6th end, down 3-2, Martin places two centre guards (just as he would in the 4-Rock FGZ). After some house cleaning, Stoughton blanks (footnote - the third blank end of the game, and there were only 13 total the whole event!). After a missed triple on Kevin’s last, Jeff draws for a deuce in the 7th end. Kevin could have tried a hit and roll instead, but the guard was so long I’d expect he knew Jeff could get it from either side even if it was perfect. Ok, three down, time to grab a beer and change the channel, right? Not with the 5-Rock FGZ. Jeff has Gould attempt a tick on his first shot, but he noses the rock through the rings and it is replaced. On Reid’s first shot he calls to come into the four foot rather than attempt a tick. Nearly every shot from there becomes a team meeting to review the options. I can’t recall a game where a team led by 3 coming home and there were this many huddles to discuss strategy. Nerve racking for the team that’s built a 3-point lead and perhaps a whole lot of blabbering to just delay the inevitable outcome, but it made for interesting TV. Usually if you give up four points in the first end, all of the air goes out of you. The challenge becomes staying focused, knowing in the back of your mind most likely you’ll be shaking hands soon and throwing back pints before the end of the day. Curling is a game of mistakes and if you make one early, it can be game over before you even started. Glenn is 4 feet heavy on his second shot of the game and now it’s an uphill climb. But with the 5-Rock FGZ, Howard was never really out of it and, most important, the game was entertaining and made for good television. He’s four down. Three has to be the play, even at the risk of not scoring a deuce. If Glenn draws to the open side and splits the house, what would Jeff do? He could guard, and Glenn may need to play a difficult double raise, on his opponent’s stone. Playing the scoreboard, it’s more likely Jeff hits an open Howard rock and sits first and third and Glenn needs to hope a double is available to get three, if not he plays the same run back for a deuce. Running short of time, it seemed Team Howard was looking for something else but defaulted on what was perhaps their best option, raising their own stone to remove the Stoughton rock and sit three. After Stoughton misses his double attempt, Howard gets three and heads to the 7th end one down. After forcing Jeff to one in the 7th end, Howard has some potential to score not only a deuce in the 8th end to tie, but possibly a three for the win. Jeff and Jon both attempt doubles but instead stick to lay two. Jeff makes a double with his last and Glenn has no chance to score his deuce. Game over. The outcome is what we expect from a 4-0 start, but the storyline was very different. Three Stoughton games in a row? Ok, I know that Team Stoughton is current Brier and World Champions, but did they really deserve all that TV time? Granted, ladies love a strong sweeping front end that can throw a little weight around (how's the Olympic training program going?). 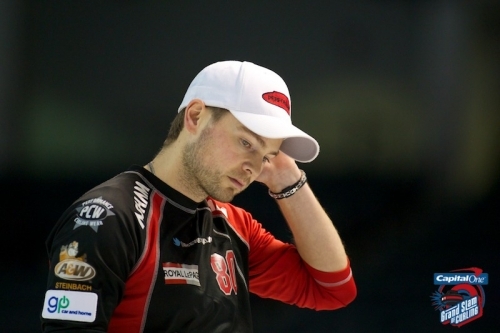 In the final we are treated to the stylish ball-caps and quality whisker rub stubble of the Mike McEwen rink. Provincial rivals in Manitoba, these teams are no doubt going to clash again in their attempt to qualify for the 2012 Brier. Stoughton starts off calling a center guard by lead Steve Gould. Unsure if he wanted it tighter but note it’s out of the house (unlike Martin’s play into the rings). Mike calls for a tight corner, rather than the come around, but they slip into the rings. Some talk early by the commentators that skips were uncomfortable with the format. Then again, they’re in the final. As I mentioned above, Jeff outsmarted Kevin Martin in their quarterfinal contest. After 13 hit and sticks, Mike hits and rolls out for the blank. Second end, another centre guard by Stoughton and Mike calls for another corner. 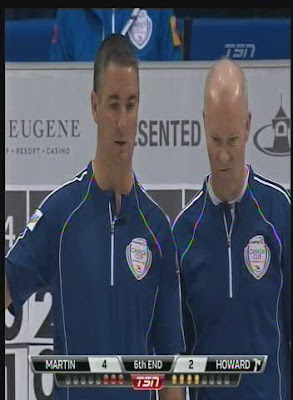 Sloppy start as they figure out the ice, Gould comes light then McEwen lead Denni Neufeld raises it into the rings. Sloppy finish too as Mike comes heavy on his first draw but Jeff makes a terrible error in coming light and leaves McEwen a simple draw to the eight foot for a deuce. Jeff could have thrown his draw as much as 8 feet further and forced McEwen to a single. An early Christmas gift. Third end, Jeff elects to play into the rings rather than throw up a second corner guard. I suspect being the third end he didn’t want to risk the game getting out of hand too early. Eventually he’s forced to one and now is down 2-1. Fourth end. Some more sloppy play and McEwen is facing more guards than a team one up with hammer needs. Unfortunately, his front end put them there. Third BJ Neufeld cleans up the mess but then gases his last shot through the rings. Stoughton is able to force Mike to a difficult draw for one. Mid-game break and the 5-rock FGZ rule has had no effect on the game thus far. It has essentially been played out as a 4-Rock FGZ game. A difficult shot to run his own back and not leave a chance for Jeff and, ultimately, he does. At this point we expect Jeff to make the double for two and tie things up, but he noses instead and he’s now 1 down without hammer entering the "End Game". They first discuss picking it out, forcing Jeff to try the same shot again. They reconsider and make what I agree is the much better shot; hit the yellow stone in the four foot on the nose and sit in front of it once it jams on the back red. The result however, is not quite what he hoped and Jeff is left with a hit to sit three. No triple in play and McEwen is forced to a single. In the seventh end, another miscue by Stoughton on his final draw attempt. Trying to touch the four foot, Jeff is Light by 3 inches; McEwen steals and leads 5-2 going into the last end. Jeff makes the double to sit three, but his rock rolls towards his other stone and leaves a double for McEwen. No mistake by Mike and it’s game over. So to re-cap, it was the 5th, 7th and 8th ends where 5-Rock FGZ came into play. Surprisingly, if Jeff had made his draw in the 7th end it would have only been used in the 5th and 7th end. It did not take long to convince me (and usually it does), this is a rule that should be adopted. Sorry to those players or fans who think it’s “unfair”. It is a minor tweak that will only adjust play in a few ends of each game, but clearly keeps a team that is down two points “in” the game, and keeps me interested to watch. It makes for better TV; what those of us on the couch and behind the glass want to see. The BDO Canadian Open has come and gone, but we can only hope its new version of curling is not forgotten. Mike McEwen and his rink from Winnipeg won the event, the cash and the somewhat controversial CTRS (Canadian Team Ranking System) points,1 which move them further ahead in their quest for an Olympic Trials berth. What the fans won was a possible glimpse into the future of the sport. To the best of my limited knowledge, use of a 5-Rock Free Guard Zone (FGZ) rule in the BDO was the first for a Grand Slam, WCT, CCA, ICF, WCF, or any other sanctioned curling event. This rule prohibits a team from removing an opponent’s rock in the FGZ area (between hog and rings) until the 6th rock of an end. I initially felt the 5-rock FGZ rule would have a minimal impact. Looking at outcomes based on scoreboard, with an albeit small sample size, it appears I was right. 5-Rock FGZ had minimal impact on outcomes, but what it did have was entertainment impact for the fan. 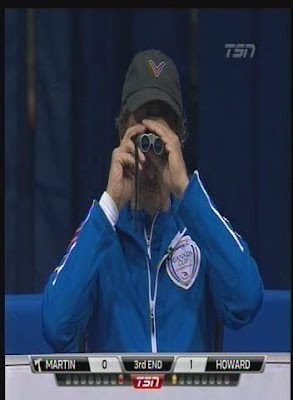 For those who missed the televised games, the archived video can be seen at http://www.cbc.ca/sports/curling/video/. I have only to draw your attention to the final end between Howard and Stoughton in the Semi-Finals where, leading by 2, Stoughton needed to make a double on his first stone to ensure a victory. There was some risk during the end of Jeff possibly surrendering a three to lose. It didn’t happen, but the drama was much higher than that of a 2 up final end in a 4-Rock FGZ game. During Stoughton’s Quarterfinal and Final game, where the winning team was up three in the final end, you’d think twice before turning the channel. At this level of skill, this usually is not the case. Some players may dislike the 5-Rock FGZ because it doesn’t reward a team’s good play. Make all your shots, solid play for 7 ends to build up a two point lead, then one critical miss in the late stages and you could give 3 back and lose. I can empathize with this point of view. A team holding a two point lead without hammer in 4-Rock FGZ wins 85% of the time with two ends to play and 88% with one to play. A visiting baseball team leading by two runs in the 9th inning wins 86% of the time and 89% when at home. Strong play through 8 innings (similar to 7 or 9 ends) is rewarded with a high probability of success. 5-Rock FGZ feels like the team behind is allowed to put a runner at second base before starting the inning. I agree, it seems unfair. But it is fun to watch and I’ll argue the other side. First end, you miss a half shot and give up two. Second end take 1. You’re down one without hammer and only 6 ends remain. You are able to get a force in the 3rd end and now are back to two down. In order to get back into this game, you must score two in 4, force one in 5, score two in 6 and force in 7. That gets you tied coming home. To get this result you must play extremely well. However, even if you play well but your opponent matches you, this outcome is not likely to occur. This is how down two after the first end against the best teams in the world usually leads to a loss. Going back to our baseball comparison, teams up two runs after the 2nd inning win 66%. In curling its 74%, and for the top teams its 85-90%. Even allowing for a large portion of these wins coming against weaker teams, when watching a curling game we may want to flip the channel after the first end deuce. I wouldn‘t leave a 2-0 baseball game in the second inning, though I may grab an extra beer and try to take a nap. I’m the first to admit one event produces only small sample sizes and we need further games to provide more analysis, but I did compare the numbers from this weekend’s 5-Rock FGZ BDO event to the previous Grand Slam, the GP World Cup. What did I notice? Less blank ends. Only 36 total blank ends in the BDO (9.3%) versus 61 (15%) in the WCGP. Teams are forced to one the same amount of time. Teams scored a single point with hammer 35% in the GPWC and 34% in the BDO. For as often the extra guard provided more opportunity, teams likely had to bail out and score a single at risk of a steal. Teams don’t score more deuces, but deuces turned into threes. Teams with hammer scored two or more 33% of the time, same in both events. However, deuces occurred 25% of the time in the GPWC and 21% during the BDO. Four or more was still a scarce event (2% GPWC increased to 3% BDO), and threes increased to 9% from 6%. Note that in both cases the increase is 50% and, though the sample size is small, we should expect an increase in scoring for teams with hammer. The 5-Rock games were more exciting. It wasn’t just the novelty and it wasn’t my imagination. Giving the team with hammer an extra guard, which is most often used when that team is down, creates more excitement. Period. Two and three down are no longer reasons to change the channel. The trade-off could be more games which don’t reach the 8th end, blow-outs after 5 or 6 ends. However, many close 4-Rock FGZ games are, both statistically and in my viewing opinion, not a close as they appear. I think 5-Rock FGZ would be a rule that improves the game for the fan and would benefit the sport. The next question to examine is, does 5-Rock FGZ change Win Probability? Sample sizes are way too small to give us any real insight. For example, teams leading by one and two in the late ends (6-8) won more often (75%/93%) in the BDO than in the GPWC (61%/80%). Given the advantage of the extra guard, we’d expect these numbers to be the opposite. When 3 or more down, teams in the BDO were able to come back, at any time in the game, 3 times out of 72 (4.2%). In the GPWC , teams only led by 3 or more 44 times, but 4 times a team actually came back (9.1%). More data is clearly needed to provide a proper comparison. Based on what we saw in all of the televised games, we could expect to see an increase in win percentage for teams down one or two with hammer in the late stages, but I will hold-off judgment until we see more data. To get more data, we’ll need to adopt the 5-Rock FGZ rule at more events in the future (yes, please!). So how did teams handle this rule during the event? I’ll dig into the three televised games and take a look…in Part II. Sometimes in life, we are surprised. The gift we receive not for a birthday or Christmas, but because someone was thinking of us. The girl we thought never noticed us actually flashes a smile back. Adam Sandler makes a movie which is entertaining and aimed at an audience over 14. Most often, however, we are not surprised. The gift only comes at Christmas, and it’s socks or an itchy sweater. The girl is actually smiling at the guy standing behind you. And Adam reaches new lows in his latest Rottentomatoes.com rankings. The first Canada Curling Olympic Trials spots, given to the winners of the 2011 CCA Canada Cup, provided little in the way of surprises. Jennifer Jones produces a deuce in the final end of the final round robin game to slink into the last play-off spot with a 3-3 record, and then proceeds to dismantle the competition in her next two contests. The Jones rinks’ mediocre play followed by a dominating play-off performance is no longer a surprise. The Chelsea Carey team by way of their 5-1 record will no doubt be a team of the future, and they will likely learn from the poise seen in the Jones rink for that final game. Jennifer has been there before and it showed. Congratulations and good luck in two years! The Men’s Canada Cup final also left no surprises. Martin versus Howard in an epic battle with Kevin the victor and Glenn, once again, falling just short. Team Howard, the Buffalo Bills of curling these past few years, took early advantage of some Martin misses and appeared to be in position to shake their recent past. But a key deuce in the 5th end followed by a Howard single in the 6th gave Martin control and he held on for the win. A very entertaining game which included many interesting moments. In the first end Glenn elects to draw into the rings and Martin forgoes the corner guard to hit and stick on the nose. Seriously? 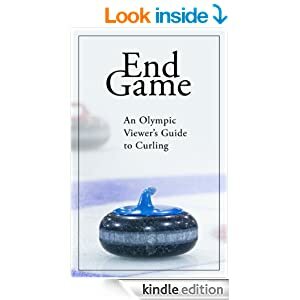 The end produces a blank and if you just arrived from a tropical island and were watching the first game of curling in your life you’d wonder what all the fuss was about. Was Kevin trying to establish hammer in the “even ends” (a theory which is not supported by statistics)? Was Glenn expecting Kevin to hit out the first end? Do these two teams really still get butterflies in a big game and both skips wanted to work them out by playing it simple? Should I really be spending these many words discussing such a boring end? Probably not. In the second end, Glenn brings his first rock again into the rings and Kevin throws up the corner guard. Game on. Some great shot making until an uncharacteristic miss by Martin third John Morris on a possible corner freeze allows Glenn to jump on the offensive, and he comes heavy. Glenn makes no mistake on his final shot of the end however, able to corner freeze perfectly and produce a steal of one. In the 3rd end, John Morris is six feet light on his final shot and we wonder if that is the same stone that was light in the last end. Glenn makes a great shot and Kevin is heavy on his next. The Howard Team gathers to discuss Glenn’s final shot and third Wayne Middaugh immediately identifies that if Kevin raises the red guard perfectly and catches his red stone in the top eight foot, he can score two. This decision on this shot is so riveting that Martin coach Jules Owchar pulls out super spy binoculars to see what is happening. They decide to leave Martin the difficult shot for two and instead block off the draw. Kevin doesn’t hesitate and immediately calls for the run-back, which he makes. Commentator Russ Howard agreed with his brother Glenn’s call, stating that if Kevin can get two out of it he deserves it. So is it the right call? We can attempt to determine the odds we believe Kevin needs to be successful in order to choose guarding the raise over the draw. Let’s assume if Glenn doesn’t guard the centre he simply guards the raise. Kevin still has to make a draw on very swingy ice to get a piece of the button. Let’s estimate a 90% success rate by Kevin to score one. Let’s assume if Martin plays the raise (as he did) he either takes 2 or Howard steals one. There appeared a small chance that Howard could steal two but Kevin would need to make a very poor shot and get unlucky. Kevin needs to be successful more than 48% of the time to make Howard want to guard the raise. What would we expect Kevin’s chances in that situation to raise a rock 5 feet and hit between ¼ to ½ a rock? I would suspect it is close. The other potential shot was for Glenn to play a soft raise hit on his own rock in the top eight foot, removing the Martin stone, and lying first, third and fourth. I like this shot as an attempt to remove the raise and block the draw. The risk is that the rocks roll into a favorable position for Martin. In hindsight (with the advantage of time and slow motion video to examine), this appears to be the preferred choice, but I don’t fault Glenn for the original call. His objective is to try and steal, take control of the game, at the risk of a Martin deuce and being one down with hammer. It’s the 4th end of a ten end game and somehow the sense is we’ve only just gotten started. An eight end game would seem more urgent. Numbers show that Glenn has a 43% chance to win and if in the 4th end of an 8 End game, it would decrease to 40%. Tied 2-2 in the 5th and Howard gets into some trouble. Wayne misses the raise double take-out, leaving his shooter as a center guard. Kevin elects to have third John Morris draw to the side, to sit two. There are 6 rocks still to come and Glenn has to decide how he wants to approach the rest of this end. They discuss a runback but recognize if he makes it perfect they aren’t shot. I don’t like trying to remove the center, it may be needed later on. Another option could have been a freeze to the back stone but to be shot they would have to be very precise and would likely leave a simple hit and stick double to lay two. Glenn could also try to draw to the centre, even perhaps back four foot, in an attempt to move play back to the centre and create a force or even a possible steal, but at the risk of giving up a big end. They eventually choose to hit the Martin stone and try to roll towards the middle. Wayne unfortunately rolls out of the rings. John makes the draw again, and Glenn chooses to again try a hit and roll on his first but noses. Kevin now is able to play a freeze and make Glenn’s final decision even more difficult. Howard decides to play a hit and stick (the roll attempt would have jammed the Martin stone on the back yellow). Kevin is left with a simple hit and stick for his deuce and a 4-2 lead. Kevin is now 76% likely to win the game. Could Glenn have taken a different approach to the end? If Kevin scores three, Howard drops to an 11% average chance to win and likely suspects it is lower than this “average” statistic in this situation. The hit and roll attempt by Wayne is attempting to bring play to the centre while also removing a Martin stone as an “in case” scenario (such as, in case we give up more than one it will not be three). If this is the 5th end of an 8 end game I don’t believe the decision is nearly as close, he has to draw. A deuce with 3 ends remaining would drop Glenn to 19%. Even here in a ten end game, I would prefer Glenn tries to draw on Wayne’s last or on skips first, to the back four foot, to bring the play to the middle. Possibly while trying to tap the Howard rock, Martin would leave more rocks in the area which could help Glenn later in the end. The question to be answered is, would you rather accept being 2 down to Kevin Martin with 5 ends to play or aggressively try to force or steal at the risk of ending things right now. Howard decided the two was acceptable. Here’s the troubling statistic: Martin is (in his small sample size) much higher than 76% when leading by two after 5 ends. In the range of 95%. Glenn is a much stronger team than the average competition and should rightfully consider his chances are better than 5% against Kevin is this situation, but by how much? After not playing aggressive in the 5th end, Howard goes all out in the 6th attempting a bounce back deuce. The look on Glenn as he and Wayne discuss their options during third stones tells it all. Howard brings their next rock behind the corner (see below). Martin throws centre guards and Glenn peels with Wayne’s last shot and his skips first. It felt like they could have perhaps played a hit off their own rock partially behind the corner and roll into the four foot and disrupt the pile. Kevin realizes the possibility and guards it on his final stone. Glenn is left with an attempt to raise the Martin shot onto the yellow in the eight foot, attempting to spin it in for two. He instead takes one and the fans, if it were crowded, may have considered leaving to beat the traffic rush. Clearly set on trying to force Martin to a single, they elect to hit the back red stone and sit two. They discuss that even if Kevin manages a double, he likely rolls out and they have a chance to come around and still force a single. I didn’t agree with the “roll-out” double. Appeared many ways Kevin would have a double to sit one and likely blank the end. However, the numbers show that a force is only 2% better than a blank (19% if down two with hammer and 17% if one down without with 3 ends remaining). My first impression was Glenn should have played a guard on their shot stone. It could be the extreme curl made guards less effective and Howard’s team felt a steal was not likely. Quickly looking at the numbers, if Glenn expects Martin to get a deuce 1/3 of the time he throws the guard, he needs to steal greater than 20% of the time to make it the correct call. Uncharacteristically, Kevin hits and rolls out, leaving Howard sitting one. John attempts to have a brief chat with his skip, but it ends abruptly as Kevin slides away leaving his third in mid sentence, mouth still open. This is what curling needs to increase its fan base, more coverage of players feuding. Like this recent first end chat between Randy Ferbey and John Morris. Martin draws for one and Howard is now down two with hammer and 3 ends to go. The 8th looks like a possible blank until Kevin makes a great draw out to the wings, corner freezing a stone, and Glenn is forced to take one. His chances go from 15% (blank) to 14% (force). In the 9th, Howard is able to put his rocks in good positions and Martin needs to throw big weight on his final stone to take one. His shooter hits over 15/16ths of Howard’s rock in the top 4 and actually spins forward a half rock to beat out another Howard stone by a measure. Now two up without hammer, Martin makes an interesting call on his final stone in the 10th. Kevin’s squad has been able to clear the guards and Glenn is forced to draw around a single Martin stone in the top eight foot. Kevin could attempt a 6 foot raise to remove the Howard stone and win the game immediately. He instead chooses to play a freeze to the back stone. He comes short and leaves Glenn a chance with a double to tie the game and send it to an extra end. I don’t disagree with Kevin’s call. The large amount of curl should enable them to bury right to the back rock and essentially end the game, but Kevin Martin is known for laser precise hitting and given a chance to end it that way, I’m surprised he didn’t chose that option. Ultimately Howard is unable to make his final shot and Martin wins the Canada Cup and first Canada Olympic Trials spot. Something tells me Glenn will qualify soon enough and perhaps in another 2+ years we can watch these guys do this all over again. Thank goodness for PVRs (Tivo specifically in my case). If not for pre-scheduling recordings of all things Curling I would have completely missed this past weekends’ games. This humble little event, historically known as the CCA Canada Cup, is played each year with a small select group of teams whom you’ve heard and seen many times before. This year teams squared off not only for a few sheckles but for the right to play against other teams in 728 days, for the right to represent Canada at the Olympics in 796 days. Kevin Martin’s win in this Canada Cup felt a little like Tiger’s big comeback win this past weekend at the Chevron World Challenge, a silly season exhibition where only 18 players contended. Was it surprising to fans that some of our best curling teams this season were not competing? Notably absent were Sherry Middaugh, leading the Women’s CTRS (aka, Canadian Team Ranking System) and John Epping, ranking third in the Men’s. Wasn’t the CCA going to give teams a break in Olympic qualifying, making it a 2 year effort instead of 3? Yes, you could argue, this Canada Cup is in the 2011/12 season, but in order to qualify to play in it, you needed to succeed LAST year. Hence, this first Olympic spot was only open to teams who started their Olympic Quest the season following the last Olympics. I’m getting a headache. With all this at stake, it would have been nice to see more coverage, televised or even via internet. I expect we’ll see extended coverage of the Pre-Trials (like we did in 2009), despite the fact the top teams will have already qualified and be watching in the stands. So how do you feel about 10 ends? I remember when 8 ends felt short, now it simply feels normal. Based on previous analysis: Is curling a battle for hammer?, I supported a theory that an 8 end game is competitively equal to a 10 end game, given the percentage chance to win based on the scoreboard stays fairly constant until 6 ends remain. Essentially, an 8 end game is a 10 end game where the teams are tied after two ends. Because we’ve been watching for shorter time, the 8 end game may appear to be different, but in effect the teams are likely playing as they would later in a ten end game, because strategy should be based on ends remaining, not ends played. For example, if a team seems overly aggressive in the 4th end of an 8 end game when down two, it’s the same approach they would take in the 6th end of a ten end contest. The debate will continue and I will stay on the fence for now….and on to the games. Haven’t we read this book before? Jeff Stoughton versus Glenn Howard with the winner to play Kevin Martin. This scenario occurred at the 2009 Brier and Olympic Trials, and feels like it happens nearly every major event. So how will the story end this time? The Glenn Howard rink have hammer in the semifinals by virtue of their win versus Stoughton during the round robin. Why is the Howard rink dressed in basic navy blue instead of lime green or shocking pink? Oh, I forgot, it’s a CCA event. The teams are all wearing single colour form fitting shirts, complete with racing stripes along the shoulders, no doubt to show off the athleticism of men in their mid to late 40s. A wonder the stands aren’t more full to see this show. If only we could bring back The Wrench, sporting a tight fitting gem with his Olympic Shape. In the first end Stoughton lead Steve Gould draws completely around a centre guard, peeking over half out the other side, showing the ice has the same swinging intensity of Plato's Retreat. Glenn later uses that swing to make a fantastic hit a roll on a stone buried in the four foot to lay two. Jeff faced several key decisions early. On his first shot, Howard sits one behind a corner guard. Stoughton could attempt a peel on the outside of the rock or a difficult corner freeze, but instead chooses to draw around the centre. Jeff makes a perfect shot. The large curl however makes Glenn’s shot, though difficult, not impossible and Howard manages to sit two after his first shot. Rather than risk another draw that can be removed for three, Jeff chooses to remove the open Howard rock and surrender an early deuce. The decision is sound in that a deuce leaves him with a 27% chance while a three drops their chances to 14%. In retrospect, Jeff may have been better to peel out Howard’s stone, let Glenn attempt a come around, then use the massive curl to take out Glenn’s shot and likely induce a blank or possibly a force. It appeared no rock was safe from being removed, but perhaps ice conditions were not identical across the sheet. I still like Jeff’s aggressive call on his first and Glenn simply made a great shot. In the second end, Glenn and Wayne are discussing Wayne’s second shot but we can’t hear them because the TSN commentators are fixated on discussing Jon Mead cleaning the sliding path. I understand commentating on curling is not easy (I learned it first hand during the 2010 Brier working for CurlTV). I also realize Jon looks handsome in his tight fitting CCA jersey. But there is enough silence during a game for plenty of playful media banter that when the players are actually discussing a shot, keep quiet! The 6th end shows both the incredible action from the rocks and ice conditions. Jeff Stoughton is down 4-2 with hammer and attempts a double on two close Howard stones. After removing both, his shooter backs up and nearly fires across the house to be removed from play. The shooter bites the edge for one. 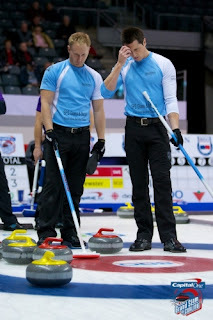 The loss gave Newfoundland hammer in the 1-2 Page Play-off game which Team Stoughton won with a key steal in 9, on their way to winning their third Brier. In the 7th end, leading 4-3 with hammer, Glenn chooses to split the Stoughton centre guard with his leads first rock. Craig Savill executes perfectly, but Howard then chooses the come around on Craig’s next shot. I'm not certain what Glenn’s thinking is there. Either he wants to eliminate Stoughton having two guards (but is happy with one) or just realized it was a 10 end game and he had 4 more ends to go. Jeff ends up facing several red rocks and discusses a hit and roll versus a draw, contemplating whether they could give up a deuce, three or even four. Realizing a deuce puts them 3 down with 3 ends to play (7% chance to win), they correctly choose to draw. To no one’s surprise however, like several shots before, Glenn is able to remove the fully buried rock and take three, nearly assuring victory. Jeff made a good shot with his final stone but may have been trying to come deeper, curl across the guard and place it where a possible jam would occur. Is it possible there can be too much curl in curling? 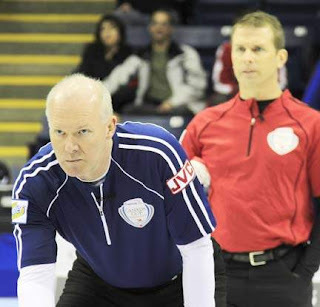 Glenn Howard again battles Kevin Martin in a final game on the path to Olympic qualification. Granted, this game is only to qualify for the Trials but it still has the intensity and drama you would expect from these two teams. This game was so interesting; I’ve decided to break this article into two parts. Join me tomorrow for Part Deux. 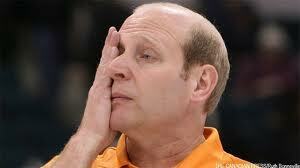 Wouldn’t Denny’s make a great sponsor for these curling events? Welcome to the 2011/12 Curling Season! Ok, I know, it started months ago, back when most of us were still on the golf course and it runs until we tee it up again. Usually curling for me begins with the first televised event of the Season. This year it was, technically, the internet coverage of the Pheasant Classic in Brooks, but as my time was limited in watching, I’ll begin with this year’s first Grand Slam, the GP Car and Home World Cup. Or GPC&HWC GS, for short. Glenn Howard faced Mike McEwen in the Quarterfinals and though not always a display of great shotmaking, it was an entertaining match. The 7th end has Team Howard up one without last rock. Howard is unable to add pressure and create any 4 foot play while McEwen is able to keep things clean and sits one back four with two shots remaining. Howard’s squad spends some time together in the house, discussing alternatives to what would appear to be a hit and stick. However, this would allow McEwen to blank and give him hammer, and a chance to score two and win in the final end. The situation has become very common when 1 up without in the next to last end: be aggressive and attempt to either steal or force your opponent to one, at the risk of giving up two. This exact situation (open rock, back rings) was examined in the early days of Curl With Math (http://curlwithmath.blogspot.com/2007/01/aggressive-play-in-9th-end.html). My assessment back then was that you need to surrender a deuce no more than 20% of the time to be the correct call. What was interesting in the dialogue, other than the fact it took them so long, was the comments “no one has scored a deuce, so they probably won’t get one in the last end”. Even said with a smile by Craig, this comment does not base any of the weight in the decision on rational thinking. The “gut” says “we haven’t scored much, neither have they; let’s head to the next end up one”. The problem is, unless ice or rock conditions are a factor, their chances of scoring two next end is not related to how many deuces they have scored during the single game or even past several games. This is comparable to a baseball manager deciding to bring in a relief pitcher against Albert Pujols simply because he’s batting 0 for 5 against him. His chances of belting a homer in his sixth appearance against the pitcher are no less likely than if he were 5 for 5. Rather than play a simple draw for one and go to the extra end without last rock, McEwen elected to try a hit on his rock outside of the rings, and roll his shooter into the yellow stone, to possibly score two and win the game. Mike correctly understood that his chances of stealing in an extra end against Howard are not good. Stats for Grand Slams have shown that teams tied without and one end remaining only win 20% of the time (larger sample size shows closer to 25%). See “Statistics for Grand Slams” at the bottom of http://curlwithmath.blogspot.com/2008/11/statistics-for-womens-curling-and-what.html for more details. #1) VS the best 5 or so teams in the World you have only a 10-20% chance of stealing depending who you are playing. Yes, it can get as low as 10% vs the best (seen the stats). I expect the numbers showing 10% are a small sample size and Mike is not giving his team enough credit. I would put them closer to 20% at a steal chance, but still you are losing 4 times for every 1 victory. What was also interesting in the discussion was clear understanding from the team that this was the shot, likely decided before it had come to rest. The time was spent on how to play it, not on whether to play it. Great call, unfortunately poor result. Joan McCusker said they “gambled and lost”. Another example of how this phrase gets used incorrectly. Which do you think is the greater “gamble”, attempting to win with this shot or taking worse odds in the extra end without last rock? The final game between Epping and Howard was one I watched with speed and determination, using the fast forward setting on my Tivo. Howard successfully used a corner guard in the first end to score a deuce (despite some great shot making by John and third Scott Bailey), but Epping bounced back with a deuce to tie (even with only 1 free guard!). This game had a more than normal amount of corner guard play and after a miss by Epping in 4, Howard was able to use another one and score a three to take a lead he would not relinquish. Even if Howard only scores a deuce, they should win at least 79% of the time. The three increased their chances to 90%. Here is a clear case where possibly the 5 rock rule could give a team some more hope of winning (2 or 3 down with 4 to play), but how much is yet to be determined. The 5th end was a prime example of Howard able to remove the corner guard and Epping having to make freezes on open rocks in the house in an effort to score two (and does), but he never really had any chance to tie with a three. The 6 and 7th end played out just as they will under a 5 rock rule. The downside being that the team without hammer, when down, gains no additional advantage over today’s rules. Must say I’m more than mildly interested in the next Slam to see how this type of end will be played. Perhaps we need more variation in the rules of each event to create additional interest. But please, I beg you, no mixed doubles. I don’t know if it’s Wayne Middaugh’s influence but this Team Howard is not dressing to match their colour tone (very “spring” and most of them are “winter”). That bright green with yellow trim does not match anyone’s complexion. It will, however, ensure they make it safely across the street during the late night hours; cars will easily be able to see them from blocks away. It won’t be all blogging for me this year. My 7 year old son actually watched the Scotties and the Brier last year and decided it looked cool enough to try this season. This is surprising given he mostly gravitates to skateboarding, snowboarding, BMX and any other extreme sport that gives his mother a nervous breakdown. My boy’s curling enlightenment led me to haul out my dusty curling pants (is there a slicker pair of black slacks that you can own?) and shoes and join the local club (St. Albert). I’ve put myself on the spare list and have memorized my line of “Sorry, I’m out of town that day” already, so as to ensure no actual rocks will be thrown. Alas, I did agree to help out with the Sunday Junior program and my body already hates me for it. The good news is that not just my knee is prepared to give out, but most of the muscles, joints, tendons and other items which make up my legs as well. It is interesting that they call the program “Little Rocks”, but in fact don’t use the actual little rocks; lighter stones which are thrown by little persons, to a house that is shorter than the normal size rink. When a 4 foot kid starts at basketball, do they play on a 10 foot hoop? Does a tee-ball player face an 80 mph fastball in his first trip to the plate? The idea of having 7, 8 and 9 year olds trying to slide/push/move a 40+ lb rock down the sheet is ludicrous. It’s surprising to me that most of the kids have not become more discouraged. I hope this interest is maintained but don’t believe we are properly setting the stage to bring these young players into the game. I was tempted to take my son out of the program when I saw that they were attempting to play the adult version of the game. I started at 12 and given the physical barriers, would suggest there is no need to start anyone before 11 unless the smaller rocks/rules are used (except perhaps your child eats hormone enhanced chicken and already shaves). He remains interested for now and I will support his efforts, with the hope that his continued failure to get a rock that weighs slightly less than he does to the hog line, much less the button (at the other end) will not discourage him enough that he decides to drop curling for more snowboarding. Is 5 the Magic Number? How about that 5-Rock Rule? 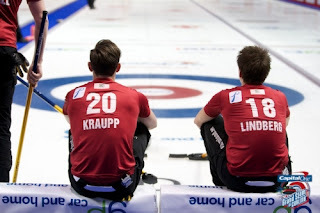 The World Curling Tour’s Player’s Association has decided to trial a 5 rock rule at the upcoming Grand Slam event in Kingston, December 14 to 18th (which one is it again, Masters or Open?) The rule would make the 4th rock of the end (thrown by team with hammer) now eligble for “free guard zone” status, unable to be removed by the opposing team until after the 5th rock, most likely the 7th rock of the end. Essentially 4 rock means that 3 rocks are safe from removal (if put in the correct location, between house and hogline) and subsequently 5 rock rule means that 4 rocks are now safe from harm. Confused yet? Though I applaud the WCT and their PA for doing what many other athletes would like to do, which is have a direct influence on their sport (ask the NBA PA how they feel these days), I don’t believe this new version of Curling will have a significant impact and may in fact result in the opposite desire than is intended. But perhaps we need to examine what it is trying to do exactly. Do we want to keep games closer? Similar to the original Pole Position on Atari, do we want the cars that are behind to have more speed than those in the lead so we ensure a close race? As I stated above, even with the 4 rock rule a team can quickly move from a close game to a position of Dominance with a quick three and then hold their opponent to 1. So can a 5 rock rule allow a game to stay closer, allowing for more comebacks? I traditionally felt 4 rock was the “fairer” rule to the old 3 rock, in that some edge was given to the team without hammer (2 rocks protected, versus 1), to offset the large advantage the team with hammer is given. Despite this edge however, teams still only win 25% of the time (closer to 20% in Grand Slams) when tied without hammer and one end to play. So can 5 rock change this? I believe the answer is yes and no. The one situation I like, and an 8 end game perhaps stresses this situation, is the fact the hammer team is, early in a game, most likely behind. For example, if I start without hammer, there are three most likely scenarios, assuming two equally matched teams. In order of likely occurrence: my opponent scores 1, my opponent scores 2 or I steal 1. Threes and steals of two or more can obviously occur, but are less likely. In each case there are now 7 ends left in an 8 end game and, though this may seem obvious, the second end is the only time in a game we are 100% assured the team with hammer is behind. The third end is also very likely to have the team with hammer either tied or behind. The most likely scenario where we have hammer and the lead in three is to take 2 in the first then force my opponent to one. In the case where the team with hammer is behind, the 5th rock must be an advantage. I don’t know how much at this point and, some argument could be made that if the play moves to the centre there would be very little impact anyway, but let’s not dispute there must be some gain in protecting one additional rock. In these early situations I support the rule as a (however slight) gain for the team that is behind and concede it just might help create a closer contest during the early ends. So what about later in the game? Today, tied in the final end, the team with last rock has a significant advantage (75 to 80%). 5 rock is not going to help the team without hammer in that situation. If you are one down with hammer in the final end, stats show a 40% chance of winning the game. Here, this rule could bump up that percentage but doubtful how much and, frankly, 40% is already competitive and engaging to the viewer. It’s rare that a one point lead in the final end doesn’t create excitement, so why change for that? Maybe if we are two down with hammer coming home, our chance might increase from 12%, but realistically to what? Even if you get your deuce to tie (considerably more likely than a three), you are in the same spot tied without hammer in an extra end, and no advantage with this 5th rock rule. Let’s move to next to last end. The 7th end (or the 9th end in a 10 end game), has often provided some of the most interesting situations since curling moved to free guard zone. Take for example the GP Grand Slam Quarterfinals, where Howard, one up against McEwen and facing a single opponent stone on the back four foot, considered freezing to try and force a single. What changes with the 5 rock rule? In a tied game, the team with hammer is not going to be forced into any different situation than today’s rules. They may elect to more aggressively attempt a deuce, at the consideration that being one up in the last end without hammer is less advantageous, but I doubt the thinking will change drastically. Today, most teams recognize a blank is less likely and the team without hammer is forcing the issue to have a score (be it a steal or surrender a single). When a team with hammer is one down, there becomes even less incentive to score a deuce, as they would have most likely greater than 40% chance if they remain one down with but their chances when tied without hammer doesn’t increase from the rules today. O the flip side, the team one up without in 7 or 9, is just as likely to be aggressive, risking a deuce at the hope of stealing or forcing the opponent to a single. They may be slightly more aggressive, but this rule doesn’t help them in that regard. So where does this leave us? If the top curlers want to try it, I support the effort and wish them well. Though I suspect the impact will be hardly noticeable, perhaps it will keep a few games from getting less competitive early and make for more dramatic contests. I doubt it. Now did anyone ask what is wrong with the game as it’s played now and have we agreed it needs to be changed? That is something I’d be interested to hear more about and would suggest that simply adding another protected rock will not repair a game if it simply does not provide enough excitement and drama for its audience or its players. For that we may need to add some physical contact to the game, though no head shots obviously to avoid concussions and excessive fines. Good luck curlers and here’s to 6, 7 and 8 rock free guard zone (which would of course be 5, 6 and 7 protected rocks) sometime in the near future. I’m looking for the words to describe the victory by North America in the 2011 version of the Continental Cup. Premature? Anti-climax? Dominatri…, er, I mean Dominance. Despite the format of loading more points towards Saturday and Sunday, the outcome appeared inevitable after Friday night’s sweep by North America, heading into Saturday morning Skins with a 90 to 18 lead. By the time John Morris dropped his draw to the button on the pin for a 9 point skin, the outcome was never in doubt. Thankfully, the Jennifer Jones rink scored a devastating 22 point carry-over, and saved us all from potential questions such as, to NA: “how will you be able to sleep on such a large lead, won’t you be nervous”, to World: Given you are so far behind, do you see an advantage because you have nothing to lose?”. The great job by the City of St. Albert (and Edmonton). The volunteers and fans who overpaid and ventured out in 10 cm of snowfall (at -34C) showed us a small arena can make an event appear important on television (even if it probably isn’t). Take note WCT, perhaps a Grand Slam in a smaller venue with full stands would change our impressions (including sponsors). Team North America were almost too impressive, reminding us all that though the game has become an Olympic sport and many governments are funding hand chosen players in an effort to usurp Canada, there is still a long way to go. The wild Olympic cheering which surprised all of us regular curling fans cannot and perhaps will not be duplicated. Several efforts were attempted, and with some level of success, but the age and soberness of the fans limited their ability to reach Vancouver decibel levels. Skills competition (Singles), though different, should not be a “regular draw”. I sat beside a man and his grandmother. Confused by what was happening, she kept asking him why they weren’t curling. Unfortunate for her but Saturday afternoon was her one chance to take in the Continental Cup and for $30 she got to watch a really neat practice. One volunteer had trouble looking up from her Sudoku during this portion of the event. The lack of excitement is evident and, even if you’re following the points, there aren’t enough at this stage of the competition to even matter. Every time the announcer called out the results, it didn’t seem to mean anything. “4 points for NA” lacks excitement when they already have 133. Staying with the Singles, perhaps they could move it to the beginning of the competition and make it no charge, in an effort to increase sales. Possibly a Wednesday night event and include a private party with the teams for those who purchase special weekend packages. Only two games over the first two days were close (and one was Mixed Doubles). That’s a whopping 11% of excitement. John Morris also appeared to be confused by the format. I won’t fault him, few fans can follow it either. While skipping during Saturday night’s Mixed Skins, he repeatedly mentioned they were playing for a “conservative” deuce in the 7th end. This was incorrect strategy. If they get a deuce, NA gains 6 points. A conservative end should reduce chance for a steal but increase the possibility of a carry-over, in which case Team World gets hammer in the final end with a possible 15 skins. If NA gives up a steal, they still have hammer and a chance at 9 points. I’ll skip the math formulas, but given where NA was at the time, the preferred approach is to go all out for the deuce in the 7th end. Likely John was following a reasonable logic of trying to win the game, something this format doesn’t always require. If you were cheering for Cana…(sorry), North America, then perhaps you are left with fond memories and pleased with the outcome of the 2011 Continental Cup. I do believe there is room on the calendar for this event and many reasons why we should all want it to succeed. Unfortunately, the results this year won’t help that cause. It will be interesting to see the final television numbers, although the real opportunity is for this event to reach beyond a Canadian audience and help market the game around the world. Until they are able to host this across the pond in Europe, that may simply not be possible. …and isn’t North America actually part of “The World”? Let me start with the apology, for those who actually follow my regular blog. I have pages of notes from the first 3 major events of the year, but have yet to produce a new article. I should have some analysis out very soon, but for this weekend I have other duties. And my feelings are very mixed. I live in St. Albert and can tricycle to this event. I’ve never been a fan and don’t actually recall ever watching more than a few ends of the “Ryder Cup of Curling” in its first 6 iterations. My parents even lived in Medicine Hat when it was the host city and I never bothered to make the trip, despite living in Calgary at the time. But after dropping in at Performance Arena (aka Servus Place) for the evening draw opening day, I am trying to feel a little different. I am on a quest to find the appeal of this event, despite its obvious (and not so obvious) flaws. The Continental Cup has struggled to gain traction from fans and sponsors over the years, and oddly I’m (sort of) looking forward to this weekend. Perhaps I can gain some insight as to why it struggles and possibly examine how it can gain the international attention that perhaps it could bring to the roaring game. Or at the very least, I can polish off a few in the Keith’s Patch while my 7 year old plays indoor soccer in the same building this weekend. Walking in, playing in my head, or was it out loud, was the old Hockey Night in Canada Theme (apologies to CBC as I know this is no longer the official name, but I don’t know it as another). Strange. Fan turnout was ok, lots of chairs appeared empty but there were many people standing around the top rail. Still, it is a small venue and would be nice to fill the stands. Perhaps $30 a draw and $69 a day is a little steep. Or maybe 34 below and TSN coverage is keeping some at home. The North American ladies started a cheer during the early ends. It brought some mild enthusiasm from the fans, though it paled to my Olympic memories. Perhaps it was the age difference in the stands or maybe the fact the actual cheer seemed more complicated than the format for this event. Someone please tell me why you get 6 points for win (team competition)? What’s wrong with 1? Oh, that’s why…. Mixed doubles is also 6, single matches are 4 and Skins are, ahem, 20, 30 or 55 points! I’m the numbers guy on this blog but damned if I have been able to figure out how this thing works without a detailed program and a financial calculator at my disposal. If I can’t follow easily, how can the average fan who heads home to a VCR still flashing 12:00? I’ve mentioned before the average age of the curling fan continues to rise and every effort should be made to make the format of this event as simple as possible for the senior crowd. It is not. What is “simple” about the structure is the fact a losing team can make a valiant comeback on Sunday and win. In fact, with 400 points up for grabs, a NA or World team can be shut out for the first 2 days and still have a fighting chance on the weekend to win. I understand why the points are heavily back-ended (260 of the 400 are “Skins” points, battled for during 4 of 5 weekend draws). When you want to attract sponsors and gain traction with a new event, it is imperative to keep the fan interested to the bitter end. As a fair method to determine the winner, or a way of simplifying things, this approach fails miserably. Golf’s Ryder Cup had no fan interest for nearly 60 years. Each match was worth one point, no more or less than any other. If a team played very badly the first day (usually Great Britain) they lost, often by a landslide. Only once the European teams began to win did the event take off and become what it is today. The Continental Cup does not, I suspect, have the luxury of waiting 60 years. It has created a structure as an attempt to build drama for the final day/draws and I believe with the exception of 1 year, has succeeded. Yet I still struggle to find its appeal. The players appear to enjoy this event and that means something. The cameras need to try and capture as much of this as possible. I noticed Blake MacDonald give Kevin Martin a big high five after the gold medal squad scored a three. Granted, Kevin looked less coordinated than Tiger after his chip-in at the 16th during the 2005 Masters, but exciting nonetheless. There is some controversy apparently on the restriction of the famous Norway trousers. Can anyone tell me one good reason why those flashy Olympic pants that became a hit in Vancouver would be disallowed or not embraced by all of team Europe? I will provide more details as my investigation continues, but I expect this could be responsible for 10% drop off in attendance, if not more. I got a chance to speak with Team NA coaches Rick Lang and Neil Harrison. Perhaps two of the nicest guys in the history of curling. I forgot to ask them about their strategy in this type of format. Actually, I forgot to ask them if they understand how the scoring system works. Hope they figure it out by Sunday…. Strategy appears interesting as it relates to singles and mixed doubles. Mixed Doubles lacks the loud screams of "hurry hard" you hear in a regular game, but does give you an opportunity to nap during the afternoon. And for the life of me, I can’t watch a player jump up from their slide and run ahead to sweep the rock without recalling my days long ago in Winnipeg, practicing against my teammates…. when I was 13! It looks and feels strange. With that many players on both sides, can’t they allow one sweeper? Some of you may have seen the TSN camera crew spot me in the crowd during the 5th end of the evening draw. It was fortunate for Randy Ferbey to be sitting next to me and gain some additional airtime, including a plug for his local St Albert sports bar, “The Rink”. Oh, and current results are North America leading 42 to 12. Does it mean anything to you either?